French Patio doors are one of the most popular ways to add a nice accent to your house that is both beautiful and useful. Whether they lead to your porch, garden or anywhere on your property, they provide a lot of light while being great style. Nonetheless, unlike their sliding glass door counterparts, they face a unique set of issues. This is because of their design. Instead of one sliding door, you have two doors that open in the middle. They can be opened together, or just individually. Here are some of the more common problems you might face with your French patio doors and some tips on how to solve. This is one of the more common issues that people face. As a result of opening up in the middle, they tend to have problems with latches not doing their job properly. A few things cause this, but generally it is the settling of the house. Remember, your house moves ever so slightly and this can cause the doors and latches to come out of alignment. When the doors don’t stay closed, just check and realign. It’s as simple as that! This is another frequent problem. As you use them, the hinges become loose over time. Consequently, when open, they will sag. This can also cause your latch to not function correctly. Check your hinges and make sure all the screws are tight. Sometimes, you might have to remove the hinges and add some wooden or plastic buttresses inside to give them some additional balance. This issue depends on the variety of French patio doors that you have. There are two types of handles usually. One version comes with a small latch that you push in order to open them. Another type is where you just twist the handle to unlatch. Each can experience sticking problems. Generally, this is just a problem with the handle. All you have to do is a spray a little WD-40 and clean out the handle from any debris that may be trapped in there. After you use your patio doors for a while, a gap may develop in between the doors. Beyond aesthetically unpleasing, this can cause air to rush through the door making your house hotter or colder. This is an easy fix. Just repair the weatherstripping or purchase a new one. You shouldn’t have to do this more than once every year or so depending on how much use the doors get. This is a little bit of a more serious issue. It depends on where the jamb occurs, but usually it is a problem with the frame. You will need to remove the trim and place some small wooden pieces so you can better level the patio doors with the frame. If you are still experiencing issues, then you will have to take out the frame and see if there is a problem with the door sill or the wall studs. As lovely as French patio doors are, these kinds of problems are just bound to happen because of the way the door is designed and used. If you want to have the nice aesthetic of these kinds of doors, but want better functionality then you do have some other options. One idea that has been gaining in popularity is to go with a frameless glass doors. 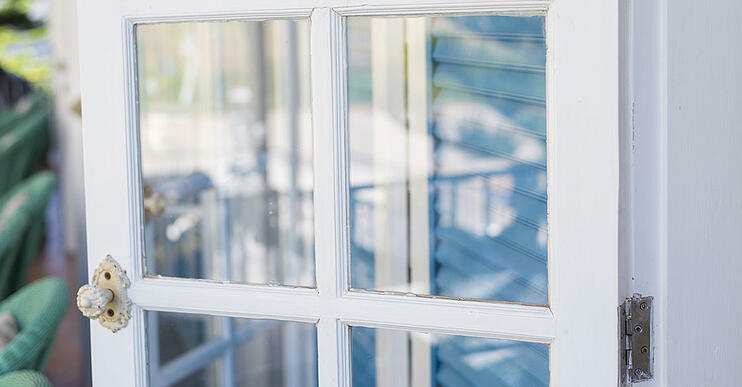 Remember, the most common French patio door problems have a lot to do with the frame. Frameless systems are much more functional. Not only this, they save space, and are custom fit for any space that you might thinking of. You also don’t face the issue of having space between the doors so they are much more energy efficient particularly in the winter and summer months. So if you are tired of constantly having to repair or replace your French patio doors then consider some of the great alternatives there to make your home not only beautiful, but easy to maintain.